The Temsah 3 displayed at the EDEX 2018 arms show in Cairo. A great revival of Arab military industry is taking place across the Middle East today as governments are trying to wean themselves from buying expensive weapons abroad. A particular bright spot for regional armaments production is Egypt, whose state-owned manufacturers enjoyed unfettered access to Chinese, Soviet, and Western technology in previous decades. But a new family of armored vehicles shown off for domestic use indicates Egypt’s strategic priorities are moving away from assembling licensed products. The Temsah 3 pictured above is the smallest among the “Crocodile” family of armored trucks. Its siblings are the Temsah 1 MRAP, the Temsah 2 MRAP with a 6×6 configuration, and the Temsah Bus MRAP with an elongated 6×6 chassis to support as many as 24 occupants seated inside the hull. The Temsah 3 is still considered a prototype and its debut with the Egyptian armed forces is speculative rather than settled. Its appearance is similar to other armored “high mobility” 4×4’s in Europe and comparisons with the aging Humvee are inevitable. The Temsah isn’t a mine resistant 4×4, however, and the armor on its hull is at least resistant to AK-47 rounds, although its windshield and the windows on its side doors look awfully thin. It eschews the emerging trend for light trucks with large engines and robust protection from mine blasts and roadside bombs–this is apparent among new models produced in China and Turkey, for example. 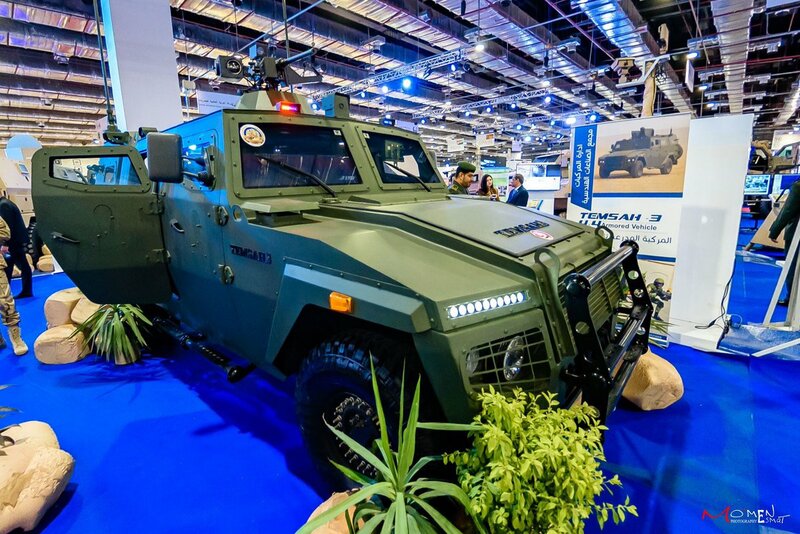 A single Temsah 3 was put on display at the EDEX 2018 arms show in Cairo where it received a fair amount of media scrutiny. But its manufacturer, the Kader Factory under the Arab Organization for Industrialization, hasn’t circulated a data sheet where critical parts such as the transmission, its engine type, performance characteristics, and protective features are enumerated. Other favorites among vehicle manufacturers are CBRN/e air filtration, external cameras, a gunfire locator on the roof, and runflat tires, yet these seem unavailable. The Temsah 3 in its current iteration does look like it can fit at least six people and enjoys the benefit of a remote controlled machine gun on its roof. A multirole 4×4 like the Temsah 3 couldn’t come at a better time for the Egyptian army when it’s putting down an Islamist rebellion in the Sinai Peninsula and fending off terrorists from neighboring Libya. The Temsah 3 will also enhance the army’s motor pool by augmenting and perhaps replacing the current assemblage of knockoff jeeps, Minerva Panthera armored cars, Arquus (formerly Panhard) Sherpas, and AM General Humvees. The ascendance of the Temsah 3 is an unmissable opportunity for Egypt’s military-industrial sector because its full-rate production may total thousands, an immense figure that can propel it to export success. But the Temsah 3 needs some more work. Armored vehicle manufacturers remain obsessed with modular options and it won’t hurt if a stripped down “commando” variant of the Temsah 3 is teased in the near future. An ambulance, a mortar carrier, a police van, a short-range air defense platform, a “tank destroyer” armed with laser-guided missiles, and maybe the addition of a 30mm cannon on its roof are some of its potential spinoffs. ← How Many Battle Tanks Does Iran Have?